Why Do You Feel Full Very Fast After Eating? Stephen Christensen started writing health-related articles in 1976 and his work has appeared in diverse publications including professional journals, ‚ÄúBirds and Blooms‚Äù magazine, poetry anthologies and children's books. He received his medical degree from the University of Utah School of Medicine and completed a three-year residency in family medicine at McKay-Dee Hospital Center in Ogden, Utah. A sensation of fullness following a meal is a normal part of the digestive process. Signals from your gastrointestinal tract to your central nervous system serve as a means to ensure you consume enough calories to meet your energy needs, while simultaneously preventing overconsumption. However, certain processes can interfere with this self-regulatory mechanism and make you feel prematurely full. This condition, called "early satiety," often stems from anatomical abnormalities in the upper part of your gastrointestinal tract. Your upper gastrointestinal tract includes your lips, mouth, tongue, pharynx, esophagus, stomach and duodenum. Digestion begins with chewing, which mixes food with saliva and digestive enzymes. Swallowing involves both voluntary and involuntary muscular activities, but once food has passed into your esophagus, its progress is determined solely by involuntary muscular contractions. Food entering your stomach is mixed with acid and additional enzymes. Once it is liquefied, food is then passed in small increments into your duodenum, the first section of your small intestine. Abnormalities in any of these processes can contribute to a premature sense of fullness. Esophageal anomalies can lead to early satiety. A hiatal hernia, which is a protrusion of a portion of your stomach into your chest cavity, is often associated with a sense of fullness. The hernia sac typically has a smaller volume than the remainder of your stomach, so it fills more quickly. Gastroesophageal reflux disease, or GERD, also causes early satiety, albeit rarely. An October 2003 "American Family Physician" review reports that early satiety in cases of GERD could be a sign of esophageal ulceration, scarring or constriction. Your stomach is more than a storage depot for ingested foods and liquids. It takes an active part in the digestive process, and stomach disorders are common causes of indigestion and early satiety. Gastritis – inflammation of your stomach's lining due to medications, infections or alcohol – can cause early satiety, as can ulcers in your stomach wall. Cancer or benign masses in or around your stomach are unusual causes. According to Dr. Henry Parkman at Temple Clinical Research in Philadelphia, gastroparesis, a condition commonly found in diabetics, is characterized by a loss of normal stomach motion and early satiety. Ulcers occurring in the first part of your small intestine, called duodenal or peptic ulcers, can interfere with stomach emptying and lead to early satiety. Food allergies are occasionally implicated as causes. Processes occurring outside your gastrointestinal tract, such as cancer, thyroid disease, liver or kidney disease, neurological disorders and autoimmune conditions can all cause early satiety. A premature sense of fullness during eating is a symptom that should prompt a visit to your physician. While many of the underlying causes aren't serious, some are potentially life-threatening. 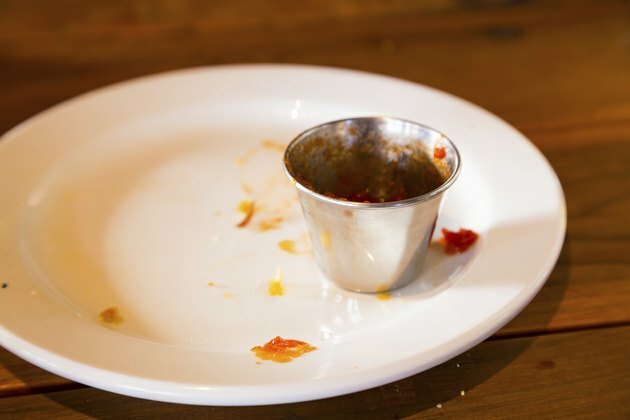 How Long Should You Wait for Your Food to Digest Before Exercising?